Quoted by Earl V. Spielman, in liner notes to Benny Martin, The Fiddle Collection, CMH 9006, 1976. 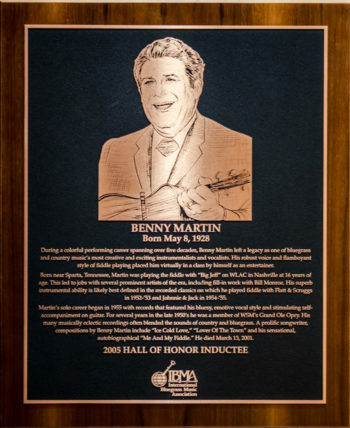 Benny E. Martin was born in Sparta, Tennessee, the hometown of legendary bluegrass singer Lester Flatt. He came from a musical family and received a fiddle at age 6 or 7. He had several teachers/mentors early on, including local fiddlers Carl Orvison and Louis Armstrong (not the famous trumpeter, but an African-American). By age 8 or 9, he was performing in the family’s band, the Martin Family, on radio station WHUB in Cookeville, Tennessee, and making Saturday evening appearances at the Upper Cumberland Jamboree. In the early 1940s, he would hitchhike to Knoxville to be near the radio powerhouse WNOX, which at various times was home to Molly O’Day, Chet Atkins, Charlie Monroe, Jethro Burns, Bill Carlisle, and others. While there, he was given employment by gospel singer Wally Fowler. A year or so later, Big Jeff Bess discovered Benny in Knoxville and took him back to Nashville. There, he appeared with Big Jeff & the Radio Playboys on WLAC. The Opry continued to be an important outlet for work. In 1947, he performed and recorded with Red Foley. Later in the year, he hooked up with Bill Monroe & the Blue Grass Boys (which included Lester Flatt, Earl Scruggs, and Cedric Rainwater). He stayed with Monroe into 1948, even after the departure of Flatt and Scruggs, and was part of Monroe’s next classic group – that which included Don Reno and Jackie Phelps. By the middle of 1952, Benny was reunited with Lester Flatt and Earl Scruggs as a member of the Foggy Mountain Boys. He joined the group when they were working at WNOX. Everett Lilly was playing mandolin at the time and Little Darlin’ (Charles Elza) was doing comedy. He recorded two sets of sessions with the group. On November 9, 1952, he recorded “Why Did You Wander,” “Flint Hill Special,” “Thinking About You,” “If I Should Wander Back,” “Dim Lights, Thick Smoke,” “Dear Old Dixie,” “Reunion in Heaven,” “Pray For the Boys.” On August 29 and 30, 1953, he recorded “I’ll Go Stepping Too,” “I’d Rather Be Alone,” “Foggy Mountain Chimes,” “Someone Took My Place,” “Mother Prays Loud,” “That Old Book of Mine,” “Your Love is Like a Flower,” and “Be Ready For Tomorrow.” Benny was always very candid about his struggles with alcohol over the years, and he readily admitted that this was the reason for his termination with the group. Benny embarked on a solo career after leaving Johnnie & Jack. He signed a management agreement with Hal Smith in the latter part of 1955 but soon afterwards switched to Col. Tom Parker, the promoter who oversaw Elvis Presley’s early rise to fame. Benny appeared as an opening act for Elvis on about 50 show dates in 1955 and early 1956. It was also during this period that Benny became a member of the Grand Ole Opry, having been signed by Jim Denny, who was in charge of the WSM Artists Services Bureau. This led to his appearing on a lot of Opry tours over the next several years. Benny signed with Starday in 1960 and recorded about 40 songs and tunes for the label. He had eight singles and one album – Country Music’s Sensational Entertainer – released on the label. But, perhaps more importantly, his music was sampled on at least 30 different various artists’ collections on Starday and its budget label, Nashville. Consequently, his music was appearing with other artists on a diverse set of albums with titles such as Nashville Saturday Night, More Country Music Spectacular (a 2-LP set), Opry Time in Tennessee, and Fiddler’s Hall of Fame. By 1965, he was done with touring in Opry package shows. He returned to his bluegrass roots, teaming up with Don Reno for a short-lived duo. 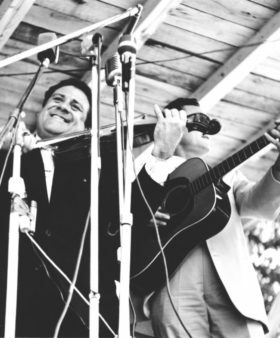 They appeared at the first multi-day bluegrass festival, on Labor Day weekend in 1965, and recorded an album of gospel songs for the Cabin Creek label. Benny’s career was much less defined for the next three-and-a-half decades. He didn’t tour much and he admitted that his drinking and no-show reputation hurt him professionally. He did tour briefly with Lester Flatt in 1977, filling in for in for Paul Warren. With the help of Alcoholics Anonymous, he finally got his drinking under control and cited November 14, 1978 as the day he took his last drink. When John Hartford moved back to Nashville in the 1970s he befriended his childhood idol Benny Martin. John was a major patron for Benny in the last decades of his life, arranging and producing recording sessions for him and promoting his legacy and prodigious talents, within a community and industry that looked upon Martin as a has been. The 1970s were witness to a number of fine recordings. In contrast to his solo recordings of the 1950s, Martin’s new efforts saw his return to the fiddle. One of the first, and best, was a collection on Flying Fish (1975) called Tennessee Jubilee, with guest artists Lester Flatt, John Hartford, Curly Seckler, Kenny Ingram, Charlie Collins, and others. A series of albums and double-album sets followed on the CMH label: The Fiddle Collection (1976), Benny Martin and his Electric Turkeys: Turkey in the Grass (1977), Big Daddy of the Fiddle and Bow, with John Hartford and Bobby Osborne (1979), and The Great American Fiddle Collection, with Buddy Spicher (1980). Also recorded was one additional release for Flying Fish, Slumberin’ on the Cumberland (1979). In 1980, Benny was diagnosed with Spasmodic Dysphonia, a “voice disorder characterized by involuntary movements of one or more muscles of the larynx during speech.” As Benny put it, it’s a “nerve disorder, or a dystonia, that gradually paralyzes the larynx.” It “destroyed” his singing and likely accounts for the dearth of new recordings from 1980 until 1999. The disorder spread to his eyes and made it difficult to keep them open. Consequently he wore a bandana tied tightly around his head, which had the effect of holding his eyelids open. Benny finished his recording career with a pair of CDs that were issued in 1999 and 2001. Called The “Big Tiger” Roars Again, Part 1 and The “Big Tiger” Roars Again, Part 2, these discs were star-studded events that recalled several of his musical triumphs of the past and paired them with new material. Benny won an IBMA award for Best Liner Notes for Part 1. Benny died in 2001 of congestive heart failure. He was inducted posthumously into the International Bluegrass Music Museum’s Hall of Fame in 2005. Today, Benny Martin’s legacy is well established among generations of bluegrass fiddlers who cite him as an influence, including notably Michael Cleveland and Jason Carter. Was childhood friends with bluegrass legend Lester Flatt. Used to skip school so he could play his fiddle but was usually located by the local truant officer who followed the sound of his music. Hitchhiked to Knoxville, Tennessee, as a young teen to appear on WNOX’s Mid-Day Merry-Go-Round. Was nicknamed “Big Tiger” by Hank Williams. Appeared as an opening act for Elvis Presley on 50 show dates in 1955 and 1956. Is recognized as one of the premier fiddlers from the golden age of bluegrass and country music, with a flamboyant and dynamic approach that captivated millions. Performed and/or recorded with a number of seminal first-generation bands including Bill Monroe, Flatt & Scruggs, the Stanley Brothers, and Don Reno as well as country legend Roy Acuff, and the duo of Johnnie & Jack. Enjoyed a successful solo career in country music and recorded for a variety of labels including MGM, Mercury, RCA, Decca, Starday, and CMH. “Rosebuds and You” (1963) and “Soldier’s Prayer in Viet Nam” (1966, with Don Reno) made the country music charts. Was an accomplished songwriter who had his songs recorded by Kitty Wells, Roy Acuff, and others. International Bluegrass Music Association Distinguished Achievement Award, 1997. 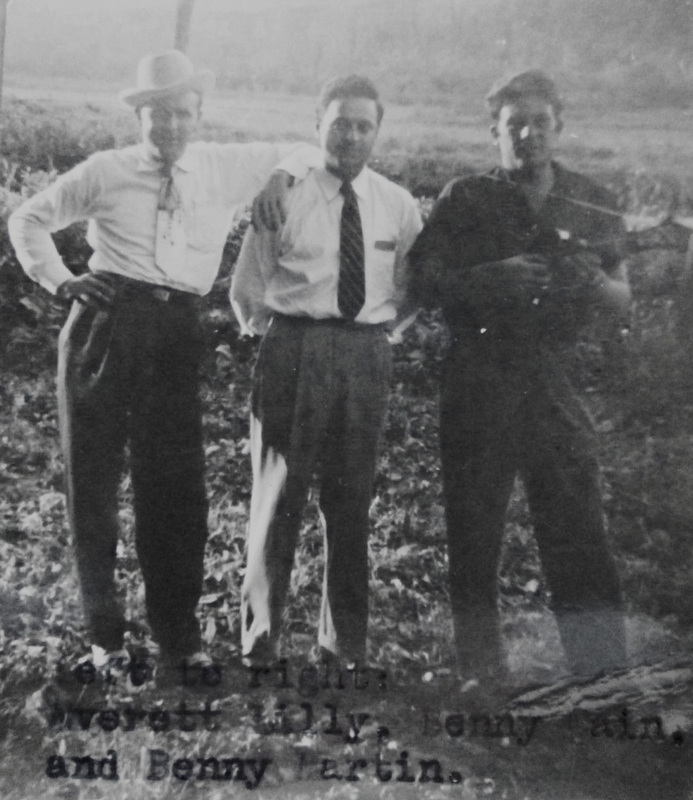 From the Archives: Everett Lilly, Benny Cain, Benny Martin. undated. Donated by Benny Cain. 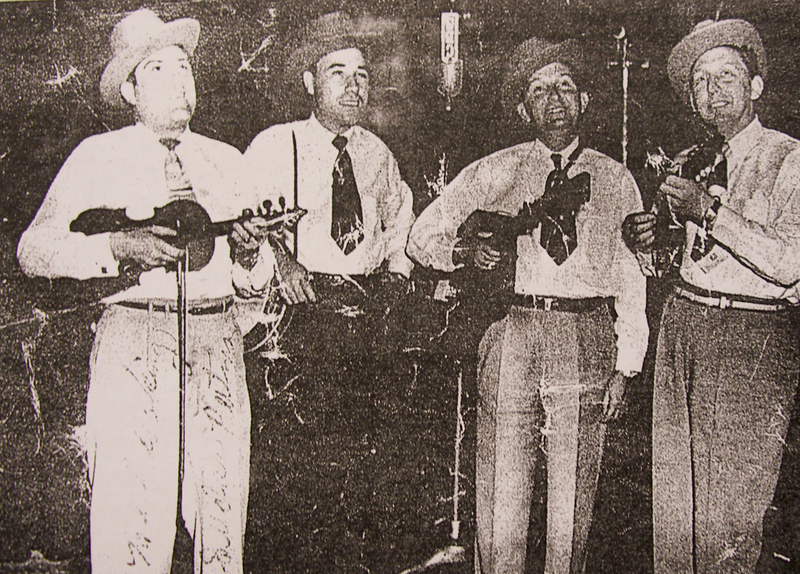 Foggy Mountain Boys Quartet: Left to right are Benny Martin, Earl Scruggs, Lester Flatt, and Curly Seckler. Benny Martin, in liner notes to The “Big Tiger” Roars Again, Part 1, OMS 25010, 1999. Frank J. Godbey, record review, Bluegrass Unlimited, February, 1980. “I first heard Benny Martin with Lester Flatt and Earl Scruggs in the early fifties and his playing opened up a whole new world to me of how the fiddle should go… [He] played these lush beautiful chords and slides that just hugged and danced and got up all around me and before the music was over I was bouncing off the walls."